Despite a new policy adopted last February, villagers have not yet been able to return home. For this reason, they filed a petition with the Human Rights Commission. Colombo (AsiaNews) – Hundreds of families from the village of Paanama, in Sri Lanka’s Eastern Province, are still homeless. Despite a policy adopted in February by the new government of President Maithripala Sirisena, residents cannot yet get their land back. For this reason, they travelled to Colombo to file an official petition with the country’s Human Rights Commission on July 27 demanding the President’s Office do something about it. 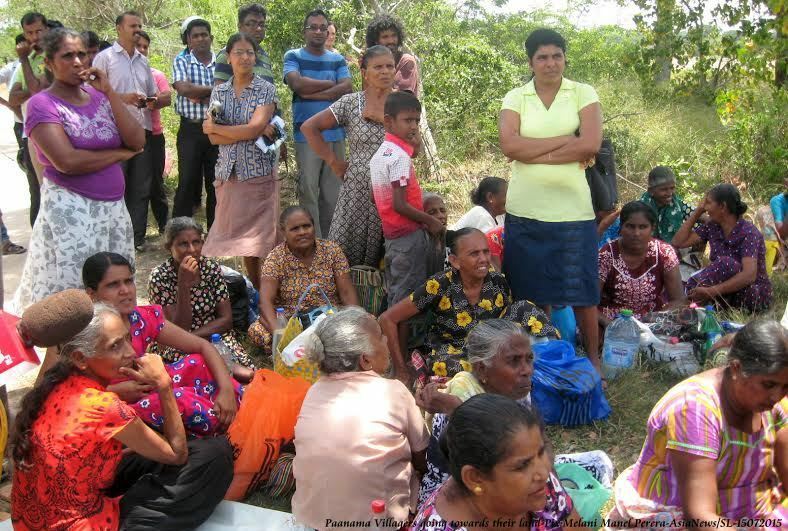 These people lost homes, land and everything they owned on 17 July 2010, when the government of President Mahinda Rajapaksa had their land seized, ostensibly to develop the tourist sector. However, most of it was placed under military control as a “high security area”. P M Bandara, a resident of Paanama, remembers what happened. "That night, some armed and masked men stormed our homes and set them on fire,” she told AsiaNews. “I was taken. One of them ordered that petrol be poured on me so that I could be burnt alive. Luckily, I managed to break free and escape. I took refuge in Buddhist temple, a monk took my defence when they came looking for me." "I later went to hide in the jungle,” she said. “Then, after a few hours, I returned to my home. The soldiers took me again. I was beaten and had my clothes taken, but I was left alive. The next day, we were no longer able to return to the village." "This land are ours; this is land where we have lived for generations; this land has fed us. Here we are farmers and fishermen,” some women said as he spoke to AsiaNews. “Instead Rajapaksa’s men threw us out like dogs, without a thought to the fact that we too are human beings. We are fed up. We do not want to suffer like this." "All we ask is to get our land back,” they said.